​Since its creation CEA has been involved in biology and health research and has become a recognised player in technological innovations and their integration. It can thus legitimately position itself as a major player in the field. ​For thirty years, the interest shown in quantum technologies has constantly grown. Europe is investing heavily in developing them and the CEA teams are playing a full role in this. Discover the main research areas on which the CEA is working.  CEA is active internationally in a variety of areas: scientific and technical cooperation, sovereign missions, support for French nuclear industry and European community. The CEA has positioned itself as a key player in building the European research area through its involvement and recognition in numerous European research initiatives and bodies. The CEA provides the public authorities and the industry with the expertise and innovation needed to develop improved nuclear power generation systems. La sécurité est une des priorités de l’Union européenne. Les acteurs de la R&D s’organisent pour être à l’écoute des besoins des équipes de secours et des forces de sécurité. Le programme Seren, dont la quatrième édition est en cours, vise à mettre en relation ces deux mondes professionnels en vue de bâtir des projets de recherche pertinents dans le cadre de H2020. Inspex is a mobile detection device that can be attached to a white cane to help visually impaired individuals locate obstacles more effectively, in three dimensions. The technologies developed for this project could find applications in many areas, including smart homes, drones and factories of the future. Tritium, a hydrogen isotope produced or used at civil and military nuclear facilities, is a research challenge particularly in the energy sector. TRANSversal Actions for Tritium (Transat) is a multidisciplinary project that aims to improve knowledge of tritium management in fission and fusion facilities.